After graduating in 1972 from the University of Edinburgh, Professor Frier trained in Edinburgh and Dundee and was a Clinical Research Fellow at the Cornell University Medical Center in New York (1976-77), before becoming a Consultant Physician in the Western Infirmary and Gartnavel General Hospital in Glasgow, Scotland (1982-87). Professor Frier’s principal research interest is the pathophysiology of hypoglycemia in humans with particular relevance to diabetes. He has published extensively in this field and has co-edited two multi-author international textbooks on hypoglycemia and diabetes: Hypoglycaemia and Diabetes: Clinical and Physiological Aspects, and Hypoglycaemia in Clinical Diabetes (now in Second edition). He has also contributed to several international textbooks on diabetes and to 5 editions of ‘Davidson’s Principles and Practice of Medicine’. Other research interests include insulin therapy, and driving and diabetes. 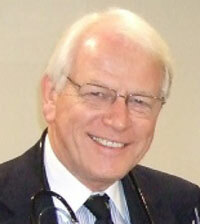 He is currently the Chairman of the UK National Advisory Panel on Driving and Diabetes.